Post by Silver Sage sponsored, Reno WheelWoman Laurie Marlowe. Last month I had the most incredible opportunity. 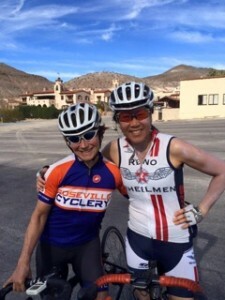 I met with the eight-woman “Bike Like a Girl” RAAM team for a weekend training camp in Death Valley. Joining us was Julie Young, Director of Silver Sage Sports and Fitness Lab and Head Coach at O2fitness. Our group was rounded out by another dozen or so cyclists from Reno, and now included 3 of my female Reno Wheelman teammates that I regularly train with. Needless to say, fueled by the energy of an amazing group of women, the spectacular setting, and exhilarating climbs and descents, I worked myself over pretty hard that weekend. Especially given that it was only January; my mileage base was extremely limited and my climbing base almost nil since October. Not sure how I did it, but I dug deep and managed to hang in there for 2 grueling days of climbing that totaled 14,000’ vertical feet in 103 miles and with grades that rivaled the Mortilolo. Oh, and did I mention the Santa Anna winds? When returned to Reno I was grateful to have had the opportunity to jumpstart my training. I felt strong. Unseasonably warm weather allowed a lot more outdoor riding. A week later I did a particularly grueling 90-minute indoor interval training session. The next day, a 4-hour endurance ride with plenty of hills. Still feeling good . . . In yoga on Monday, I felt weak. Kind of weird, since I’ve felt a lot stronger in yoga since starting Julie’s workouts last fall. Wednesday’s core class had me crying for mercy. The next weekend on my rides I noticed a couple of things. #1, I couldn’t get my HR up. My threshold HR at this time of year is around 165 but I was struggling to get it above 150. On a short hill, I picked up my pace, challenging my husband to a sprint to the top. Big mistake, my heart rate hit 160 and I cratered. He pulled away easily, leaving me in the dust and with nothing left in the tank. I noticed a couple of other things too that week. I was sleeping like crap. And not surprisingly really tired during the day. And I was having aching pain in my hands, which I have come to recognize as a signal that my diet could be better, i.e. inflammation. Cytokines? Followed her advice and I’m back at it. Took a couple of weeks to feel like myself again, but I’m there; and a little wiser. And I’m going to make sure that from now on my training plan includes REST, as well as quality time and my bike. As title sponsors of the Reno Tahoe Junior Cycling team, we have the opportunity to support the team, in their pursuit of excellence, with bike fitting, physiologic testing, as well as provide advice on training and recovery strategies. Below is a post from the team’s director, Trevor DeRuise on the importance of bike fitting for his athletes. Cyclists are very well known for going to incredible lengths to squeeze a little more speed out of their bikes. Shaving a few grams off of a competitive bicycle can literally costs thousands of dollars and deliver such marginal improvement that it’s easy to wonder if the investment is really worth it. Curiously, one equipment upgrade that so many people overlook is a professional bike fit. For a fraction of the cost of a new carbon wheelset, a professional bike fit improves performance, comfort, and protects riders against overuse injuries. While any cyclist can benefit greatly from a professional bike fit, I would say this service is exceptionally important for junior cyclists. The reason is that junior cyclists are constantly growing. With this, their fit is constantly being altered even if nothing on the bike is actually changing. In order to both prevent injury with their young joints as well as maintain optimal performance and comfort, having fit assessed throughout a junior cyclists season is paramount. As the 2015 season nears for the Reno Tahoe Junior Cycling team, we were privileged to have our athletes visit Silver Sage Sports and Fitness Lab for pre-season fits, with Julie Young, before training really got underway. Having come off a 3 month off season, it was apparent that several athletes were already in need of raising their seat height. This was just the tip of the iceberg though, as every angle of the athletes body was then measured and analyzed in order to create optimal muscle recruitment through every pedal stroke, prevent overuse injuries in the knees, and provide optimal comfort for long rides. During the fit process, other fundamental yet incredibly important things like pedal technique were also taken into consideration. Focusing on all of the small things that are often overlooked like this early in the season can help young athletes create good habits and allow them to get the most out of their training while minimizing injury risks. I understand how challenging junior racing can be for families from a financial standpoint. With this, I’ve never been one to recommend “buying” performance in the shape of fancy carbon parts or new bikes every season. Instead, I recommend finding the potential of your rider’s current setup through a proper fit and analyses. At the junior level, the most important thing is keeping the rider safe, efficient, and letting them fall in love with the sport. This team of eight inspiring women, are moms with professions (including two nurses, a public defender, a fighter pilot and a few small business owners), and are training to set a new RAAM record. However the team’s bigger mission is raising money for worthy causes. To learn more about the team, visit www.bikelikeagirl.org and follow them on Facebook. The following post is provided by Bike Like A Girl Team member, Erin Ferner, who is seen sporting a handstand in the opening pic. It is amazing what can be achieved when you gather a group of like-minded individuals together to push the limits. Death Valley, California: it was here we gathered with our bikes, coming from all different directions to meet and pedal; to climb; and to explore. It was the greatest combination of hard work, rugged scenery and a whole lot of determination all wrapped up in a long, memorable training weekend. For a group of us, this training weekend was preparation for a big adventure that lies ahead this coming June. Our eight women racing team, Bike Like a Girl, will take on Race Across America (RAAM) 2015. Being on a team requires faith and trust that each team member will put in the work and give their best when the clock starts and the race begins. It also requires the leadership of a knowledgeable coach. A coach who believes in each athlete individually who makes up the team as a whole. We are honored to have Julie Young, of O2 Fitness, guide us as a coach in making our goal a reality in crossing the finish line of RAAM this summer. Our time spent in Death Valley training as a team with our coach and a fantastic cycling group from Reno was incredible. Every day we were there was filled with time on our bikes fighting the wind, rotating through the pace line, adjusting to the dry climate, and a whole lot of climbing. Each ride brought new challenges. We had a 25 mile climb straight up with a 15-18% grade at times to the top of Dante’s Peak. The view was worth every push on the pedals. We fought head wind, dust and more challenging elevation at a ride in Stovepipe Wells where we were, in the end, rewarded with descents that brought butterflies to our stomachs. Every ride brought new momentum and focus to the goal up ahead. Bike Like a Girl is thankful to have had the opportunity to train surrounded by Coach Julie and the amazing group that provided support and encouragement while we were in Death Valley. In the end, as cyclist all of our desires are really the same- ride in the moment, enjoy who you are with, work hard- on the bike and off, and in the toughest of moments, breathe and be thankful you have the ability to ride and live this amazing life of yours. Ride on, friends, and make the best kind of memories you possibly can on two wheels. We certainly did. Words from a Racer: Death Valley. I lived out of my comfort zone. I did something new and different and it was really hard but extremely empowering- like the descent after a climb. I bit my lip to stay brave. When you have to climb all the way up from below sea level, everything only goes up from there- heart rate, altitude, views, the fight and determination inside to make it to the top. We had funny tan lines and silly helmet heads. We all fought the wind to pull the pace-line and each other. We were surrounded by 360 degrees of passion- for adventure, cycling and just the pure joy of an epic challenge. There were unspoken moments of understanding each other and why we do what we do. I don’t think I’ll ever be the same. But I don’t think we are supposed to be. Not after something like that. Convincing myself that I can climb hills…. This is just one of the small inner arguments that goes on inside my head. It’s not the end of the world if I cannot climb, but it is a challenge I present myself often. If not to prove anything other than to just continue my pursuance of overall fitness. Okay, I admit it. I’d love to be able to simply keep up with my friends and teammates, too! Climbing is hard for some of us. You’re grinding away in your small chain ring, wishing you could magically turn that crank faster, and up your cadence. Your thighs are burning and your breathing is labored. Regardless of where you place your hands on the bars, it’s hard to find any relief. Dare I try to stand up and pedal periodically or stay in the saddle? It seems to take forever and all you can think of is the glorious decent that you will have earned on the other side. A few weeks ago, many others, and I were fortunate to have the opportunity to travel to Death Valley, CA. for some amazing cycling and training. We rendezvoused with the RAAM – Bike Like a Girl 2015 team, two of them who live right here in Reno and are on our local girl-team, the Reno Wheelmen. The icing on the cake was that the coach for both this team and our girl-team, Julie Young of O2fitness and Silver Sage Sports, joined us as well! I cannot tell you how thrilled we were to have her with us! We rode twice the first day. The first ride consisted of quality intervals. As Julie rode by our side, she taught me to lighten up a bit! Being the micro-manager that I am, she taught me quality vs. being a slave to the timer. This is especially helpful for when you’re doing your intervals on a course that requires some flexibility in your timing. On day two, we climbed Dante’s Peak. This climb was the nemesis of my trip; I had a bone to pick with this hill! Two years ago, I had to walk parts of that last quarter mile, which has grades of 14-18%. Even though Julie made the summit long before I did her coaching and encouraging voice played in my mind continuously. The trip was rounded off nicely with a fantastic ride out to Scotty’s Castle. Because of Julie and her wealth of training and racing knowledge, not only do I have a very strong foundation to build upon, but I have daily expert guidance. When you are in your pain-cave, it is a coach’s voice and training that brings your focus back to what will help you succeed, however that may look to you. So much of this is mental. When you have a coach that you respect and trust, it makes it easier to fight your mind with her/his words. I have found this with Julie Young and so will you. I made it up Dante’s Peak without walking once. http://silversagecenter.com/wp-content/uploads/2015/02/1517722_1027863690563993_2394596054036143073_n.jpeg 240 320 julieyoung http://silversagecenter.com/wp-content/uploads/2014/06/SS_14171-Logo-Development-SportsLab-Horz-header-300x83.png julieyoung2015-02-10 14:49:512015-02-10 14:49:51Convincing myself that I can climb hills…. It was good to get out and run this past Saturday, it was for a good cause, Running Red for Heart 2015 put on by REMSA. I also met some very cool people. Like the gentleman I am pictured with, Korean War Veteran of the United States Marine Corps…Sgt. Harold Holder, author of Please Leave the Lights On, his story about recovery from a TBI. We hit it off immediately! The run went off without a hitch. It was cold running into the wind, but we beat the rain! I finished 15th overall with a time of 30:16, not my best, but considering I had a lower back procedure done just 15 hours prior to the race…I’ll take it! The best part was being contacted later in the day by Mr. Holder asking me if I would like to come to Pensacola Florida to speak about TBI’s with a Marine Corps Foundation that he and a few generals have started. Are you kidding me…of course I will go, that’s a huge honor! As you can see in the photo Mr. Holder is wearing a USMC hat, I am holding his book that he autographed and gave to me…none of this would have ever happened if I had not walked up to him and thanked him for his service. I know a lot of us have our own demons, I am right there with you…but we can choose to remain silent…or choose to reach out!! Just a simple thank you is all it took! He said it was a pleasure to meet me, I assured him, the pleasure was all mine!! Last summer, my job took over my life. I spent several months looking out my office window while sitting in front of a computer monitor full of stuff that needed to be done. Deadlines were looming and there wasn’t enough time in the day to do much besides taking my dogs for their daily walk. It took a toll and I ended up gaining weight, losing fitness, suffering from back pain on a regular basis due to sitting too much, and generally being stressed out and , frankly, cranky. With autumn and the completion of those projects, it was time to get back in shape. It’s been a long journey back that is still in progress. As I’ve written here before, though, Coach Julie Young has been instrumental in helping me get on the path back to fitness and I fully intend to stay there. Well, 2015 started with a fresh set of deadlines that were totally unexpected. My blissful time as “an athlete pretending to do work” had come to an end. As the projects began to pile up again, I chose to learn from how the summer unfolded because I don’t ever want to feel that bad again. I consulted with Julie to let her know that my time was becoming severely limited, but I was bound and determined to do what I could to stick to my plan. Her comforting response was to focus on the quality of the workouts and do what’s possible – key points for any working stiff who’s hoping to balance all the demands of daily life with an athletic pursuit. As a result, my trainer now has a permanent place in my home office, so when a ride is called for and I can only squeeze in so much time, it’s there to remind me that it is possible. It may not be optimal to do your SFRs or sprints on the trainer, but it’s better than the alternative – something is better than nothing. The structure of the workout plan also helps, in that I can take a half an hour here and 45 minutes there to stay as fit as possible. I may be a sweaty mess in front of my monitor, but I feel so much better knowing that I’m paying attention to what my body needs. Race season starts in less than two weeks and, thankfully, I feel as prepared as I can be because I had the guidance from Julie to stick it out when time got crammed. 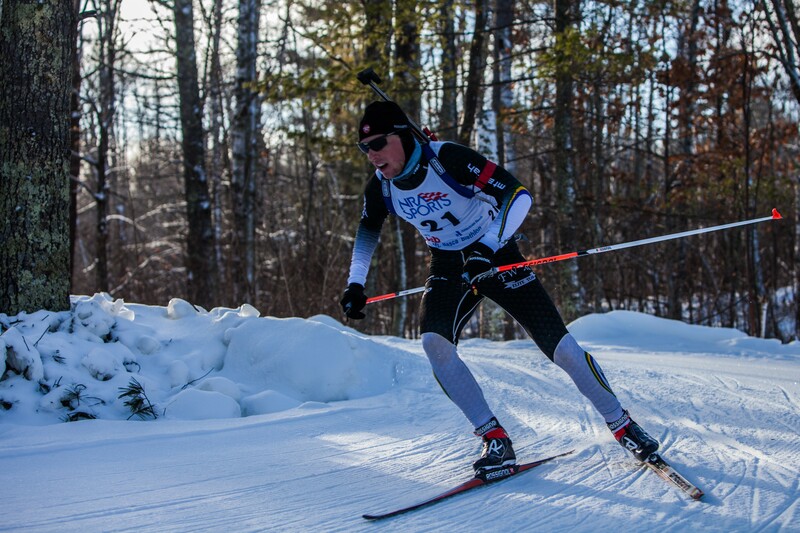 Below is a clip from a recent biathlon sprint race I competed in last month in Soldier Hollow, Utah. So far this season I’ve travelled to races in Canada, Minnesota, Alaska and Utah. 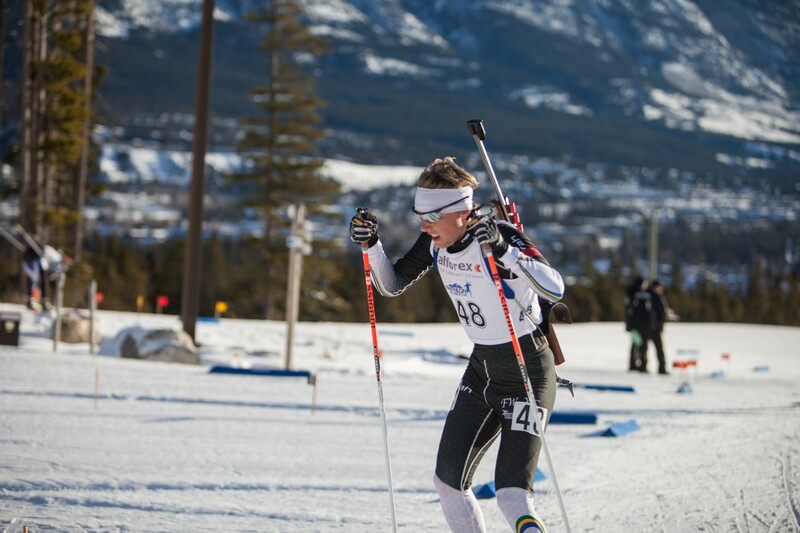 In the coming month I’ll be heading to races in Idaho, New York, and Wisconsin, and then I’ll be back in Truckee in March for the biathlon national championships, hosted by Auburn Ski Club. This time of year, our body builds up a lot of fatigue from all of the racing and travelling, and our priority is to keep ourselves rested and healthy for our upcoming races. One of the reasons we do large amounts of intensity and volume training in the summer and fall is so that we have a good training base built up, which allows us to “coast” through the season. With so much racing and travelling, we have less energy and time to put into other training sessions, so we rely heavily on that large training base we built to keep us fast and fresh thorough the winter.